This was the first thorough analysis of the New York Times’s Middle East coverage to appear in a mainstream publication since the Palestinian uprising began in 2000. Originally published in March 2003, it subsequently appeared as a chapter in a book on the Middle East. Even though the violence now looks as if it may have abated, many of the points in this article about the Times’s coverage remain as relevant today as when it was written. As the world’s most important daily newspaper, the New York Times is enormously influential in framing the public and diplomatic discourse on many issues, both in the U.S. and beyond. This is particularly true with regard to the Middle East, given how much space it devotes to the subject. One of the great myths of modern journalism, particularly outside the U.S., is that the New York Times is “pro-Israel.” It would be truer to say that the opposite is the case – to a greater extent than even most of those readers who suspect it of bias might think. In all kinds of small, insidious ways – most of which are not apparent unless you have detailed knowledge on the Middle East – the Times’s coverage is slanted against Israel. And at least until recently it was also slanted against Palestinian moderates and reformers, the Times preferring to put a positive spin on those Palestinian leaders who were corrupt, dictatorial and violent. And since the Times has a reputation as being the great paper of record, the consequences of its distortions can be much more damaging than those found elsewhere. Especially outside the U.S., some mistakenly presume that the New York Times must be pro-Israel since it is owned by a family that was originally Jewish and has a number of prominent Jewish writers and editors. In fact, it may be precisely for this reason that it bends over backward to avoid being seen as favorable to Jewish concerns. There would be nothing new in this, as was seen when the Times deliberately downplayed reports on the Holocaust in the 1940s. Perhaps, when future historians examine the Times’s record in recent years, they will conclude that their biggest mistake was to have spent years sanitizing the image of Yasser Arafat, in effect helping to persuade Western governments to continue propping up his regime, while both Palestinians and Israelis died as the result of his policies and the formation of a democratic Palestinian state was continually delayed. Liberals like myself want to see two democratic states, one predominantly Palestinian Arab and one predominantly Jewish Israeli, coexisting in peace. But we have also followed the conflict closely enough to know that the Western media’s misreporting has contributed to the failed policies in the region of both American and European diplomats. AS the world’s most important daily newspaper, the New York Times is disproportionately influential in framing the public and diplomatic discourse on many issues, both in the U.S. and beyond. This is particularly true with regard to the Middle East, given how much space it allocates to the subject. One of the great myths of modern journalism, particularly outside the U.S., is that the New York Times is “pro-Israel.” In fact, it would be truer to say that the opposite is the case – to a greater extent than you might think. On March 4, a 59-year-old American Baptist, William P. Hyde, was among 21 people killed by a suicide bomber in Davao in the southern Philippines. That an American died was made clear in the following day’s New York Times. The Times titled its news report “Bombing Kills An American And 20 Others In Philippines.” The first seven paragraphs concerned Hyde, who had lived and worked in the Philippines since 1978, and another American, Barbara Stevens, who had been “slightly wounded” in the attack. The caption alongside two photos at the top of the front page of that day’s Times also made reference to his death, as did a news summary on page 2. In addition, the paper ran an editorial titled “Fighting Terror in the Philippines.” And a front-page photo of a wounded boy, and the caption that accompanied it, made clear that at least one child had been among the injured. On the next day (March 5), another American Baptist, 14-year-old Abigail Litle, was among 16 people killed by a suicide bomber on a bus in Haifa, Israel. The story and photo caption in the March 6 Times, tucked at the bottom corner of page 1, made no mention of Abigail’s name. Neither the headline nor the photo caption indicated that an American had died, or that the suicide bomber had deliberately chosen a bus packed with schoolchildren, or that a majority of those killed had been teenagers. The suicide bombers in both Davao and Haifa were acting on behalf of Muslim fundamentalist groups fighting for separate states. But the Haifa bomber was arguably worse. He deliberately chose children as his target, and his bomb was packed with specially sharpened nails and shrapnel to maximize pain and to make it harder for doctors to save the wounded. Readers of some newspapers – but not of the Times – were told that Litle’s Missouri-born parents had rushed to Haifa’s Rambam hospital to look for their “wounded” daughter and instead had found only what remained of her: her legs. They had identified Abigail from an ankle bracelet still attached to one of them. That day’s New York Post carried a picture of the pretty, blond-haired New Hampshire-born schoolgirl who had been active in Jewish-Arab school dialogue groups on its front page. The lack of prominence given to Litle’s death is one small example of what has become a familiar pattern at the Times. The paper downplays Israeli suffering, and de-emphasizes Yasser Arafat’s responsibility for the suffering of Israelis and ordinary Palestinians alike. While the Times couldn’t find room to include a photo of Abigail (or any injured child) last Thursday, it did choose to again run what it terms its “Mideast Death Toll” chart alongside the news report about the Haifa bomb. Strangely, the Times (to my recollection) usually runs this chart – in which it lines up total numbers of Israeli deaths next to the greater number of Palestinian deaths – only on days after Israelis have died. The implication would seem to be that Israel is responsible for more fatalities than the Palestinians. It also seems odd that the Times doesn’t (to the best of my knowledge) run these kind of football-score-type charts for any other conflict (Protestant vs. Catholic deaths in Northern Ireland, for example, or Afghan vs. American deaths since September 11). The chart itself is fundamentally misleading. It makes no distinction between civilians and armed combatants, lumping together suicide bombers and other gunmen killed on shooting sprees with their innocent victims. It also reports suspected Palestinian “collaborators” killed by their own compatriots as if they had been killed by Israelis. If the Times wanted its readers to gain a better understanding of what is actually going on in the Middle East, one could think of other statistics it could have given. It could have informed them that 80 percent of Israeli fatalities have been noncombatants, half of whom have been female; or that less than 5 percent of Palestinian fatalities have been female; or that a much higher proportion of Israeli casualties than Palestinian casualties have been older people. All these would be a good indication of which party is targeting the innocent. But there is a further problem. The Times appears to have inflated the number of Palestinian dead. “At least 2,100 Palestinians have been killed during the months of violence that began Sept. 29, 2000,” stated the Times caption accompanying its chart on Thursday March 6. Yet the Reuters news agency – which even Palestinian Authority officials have admitted is sympathetic to their “struggle” – provides a considerably lower figure. In a story on March 7, Reuters Gaza correspondent Nidal al-Mughrabi writes: “At least 1,906 Palestinians and 720 Israelis have been killed since the Palestinian uprising for statehood began in September 2000.” Not only is Reuters’s estimate of Israeli dead higher than the Times’s, and the Palestinian figure considerably lower, but the Reuters statistics also included 11 more Palestinian militants and civilians who had been killed in disputed circumstances that morning, March 7. The New York Times has taken its statistics for its “Death Toll” chart from the Palestinian Red Crescent, which it should know is a highly politicized and sometimes militant organization – Red Crescent ambulances have on more than one occasion been caught smuggling suicide bombers into Israel; and at least one Red Crescent medic became a suicide bomber herself, killing or injuring over 150 Israeli civilians at a west Jerusalem shopping arcade last year. has played in killing Israeli civilians during the Intifada. If the Times wants to rely on Palestinian sources, it might do better to follow the Palestinian Human Rights Monitoring Group (PHRMG), whose mission is “to end human rights violations committed against Palestinians in the West Bank, Gaza Strip, and East Jerusalem, regardless of those responsible.” The PHRMG, while certainly no friend of Israel (it is often brutal in its criticism) is nonetheless relatively free from the influence of Arafat’s security forces. A PHRMG press release dated March 7, 2003, states that “since the start of this bloody Intifada on September 29, 2000, 1973 Palestinian people have lost their lives” – a figure that again includes Palestinian terrorists, but is still significantly lower than that used by the Times. The New York Times is hardly the most anti-Israel newspaper. And it is much too measured and careful to indulge in the kind of ugly calumnies found, for example, in the London Guardian – which in a lead editorial last year compared Israel to al Qaeda, concluding that Israel’s behavior was “every bit as repellant.” Still, in all kinds of small, insidious ways – most of which are not apparent unless you have expert knowledge on the Middle East – the Times’s coverage is more slanted than many readers might realize. And since the Times has a reputation as being the great paper of record, the consequences of its distortions are in some ways much more damaging than those found elsewhere. Less than 5 percent of Palestinian casualties have been female, and even fewer have been pregnant mothers. Yet when one is killed – as happened on March 2, when a wall accidentally fell on her – the Times takes care to let its readers know: in news reports on March 3 (page 6), March 4 (page 1), March 5 (page 3), and March 9. Readers would be forgiven for assuming that Israel killed pregnant mothers every day, but these stories all refer to the same unnamed woman. The New York Times also neglected to emphasize that the woman’s unfortunate death happened in the course of a successful military action to capture Mohammed Taha, cofounder of Hamas, who was hiding in the house next door. The front-page report by James Bennet (“Israeli Raid Snares a Foe, but leaves Family Motherless,” March 4) refers to Taha only as “a known militant.” Not until the twelfth paragraph, on an inside page, does Bennet mention that Taha is a leader of Hamas. (He is in fact the most senior one ever caught.) 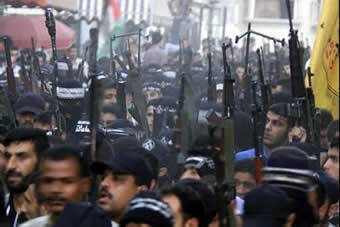 Other papers ran headlines such as “Israel nabs Hamas founder in Gaza” (Daily News, March 4). 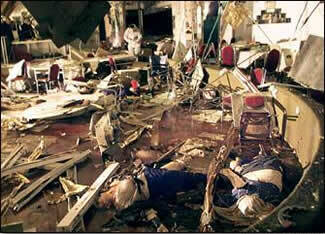 This was an accidental death in the course of a legitimate counterterrorist action. But a number of pregnant Israeli mothers were killed deliberately. If their deaths were reported at all, the Times and other media have referred to them merely as “Israelis” or as “settlers.” For example, when a pregnant Israeli, her infant child, and other family members were attacked at their family Passover meal at Elon Moreh on March 28, 2002, the only coverage the Times provided was the following sentence buried in an article about Yasser Arafat: “Even as Mr. Arafat made his pledge, a Palestinian gunmen shot and killed four Israelis in a Jewish settlement near the West Bank city of Nablus.” No mention of the seven children left orphaned in that attack. When the Times has sympathetically profiled women who have died in this conflict, it has more often been the suicide bombers than their Israeli victims. 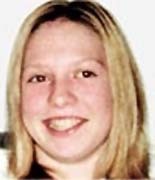 Wada Idris – who killed or wounded 150 innocent civilians on Jerusalem’s Jaffa Road on January 27, 2002 – had “chestnut hair curling past her shoulders”; she “raised doves and adored children,” James Bennet reported in a front-page article for the Times. 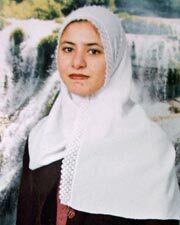 While the schoolgirl victim of al-Akhras’s bombing (Rachel Levy, 17) was finally named a week later in a third Times article (which again provided a photo and details of the terrorist – Joel Greenberg writing that al-Akhras wore jeans, had “flowing black hair,” and so on), the male victim of the bombing was apparently deemed to not be newsworthy: His name was never mentioned. He was in fact Haim Smadar, who was temporarily working as a security guard at the supermarket during the Passover holidays, and who used himself as a human shield to keep al-Akhras from taking more lives. DOES THE TIMES HAVE AN AGENDA? The Times’s distorted presentation of events is especially troubling given the very high respect in which the paper is generally held by its readership, policymakers, and other members of the media. The Times’s framing of the conflict has for years contributed to bad diplomacy at the State Department and elsewhere, and has fueled negative images of Israel among the public at large. As I know from personal experience working as a correspondent in the Middle East for both American and European papers, foreign news editors throughout the world often look to the Times for story ideas. Every evening, editors across America check the next day’s front-page stories on the New York Times before altering their lineups. Especially abroad, some mistakenly presume that the New York Times must be pro-Israel since it is Jewish-owned and has several prominent Jewish writers and editors. In fact, it may be precisely for this reason that it bends over backward to avoid being seen as the “Jew York Times,” as one European journalist I used to work with in Israel called it. There would be nothing new in this. The Times deliberately downplayed reports on the Holocaust in the 1940s. It hid news of the ongoing genocide of European Jewry “in small print on the back pages... Jewish-owned but anxious not to be seen as Jewish-oriented,” as historian David S. Wyman put it. in response, which the Times did list, came in a vacuum. The slants and omissions in the Times can be found well beyond basic reporting. For example, in last year’s “Year in Review” calendar (December 29, 2002), the Times highlighted the most important events of the year. The entry for March 28 read: “Arab world agrees to relations with Israel if land is returned” (this is hardly news; it is a claim some Arabs have made for decades) – followed directly by, on March 29, “Israel invades Yasser Arafat’s headquarters, 5 Palestinians, 1 Israeli die.” The reader is left with the impression that Israel’s only response to the supposed Arab peace offer was violence. The Times does not seem to be living up to its self-proclaimed reputation for thoroughness. “All the news that’s fit to print,” trumpets the paper in a famous box on the top left corner every day. In practice, however, the editors only correct a very small proportion of the paper’s many Middle East errors and slurs against Israel. The celebrated political commentator Walter Lippmann once observed that “The study of error serves as a stimulating introduction to the study of truth.” This seems to be the case here. But, given the Times’s track record of Middle East coverage – and the inflammatory accusations and conspiracy theories against Jews and Israel presently popping up elsewhere in the media – does anyone really believe that this will be so “obvious” to the Times’s millions of readers? The Times does have a pro-Israel columnist, William Safire. But this hardly makes up for the slant of other columnists (it would take a whole book to explain how Tom Friedman gets it wrong on Israel), let alone those of its outside contributors – such as Allegra Pacheco, a Jewish lawyer-activist who represents Palestinians in the West Bank and condemns Israel as an “apartheid” state; or Henry Siegman, another Jewish activist whose writings are presently proudly displayed on the website of the Palestine Liberation Organization. Indeed, the New York Times’s idea of balance almost seems to be to run alternating pieces – first by Palestinians and others condemning Israel, then by far-left Jews condemning Israel. When an outside op-ed writer, the noted international human-rights expert Prof. Anne Bayefsky, included a sentence sympathetic to Israel in her article (May 22, 2002), the Times tried to muzzle her. Only through dogged persistence, Bayefsky says, did she manage to persuade the Times to restore a sentence criticizing the U.N. Human Rights Commission for directing a full 30 percent of its resolutions against Israel. 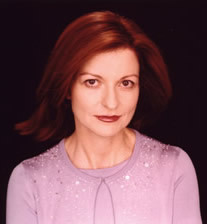 Bayefsky was so exasperated by her experience with the Times op-ed desk that she wrote an entire article about it in the June 2002 edition of the legal magazine Justice. The Times also likes to devote ample publicity to anti-Zionist Jews. 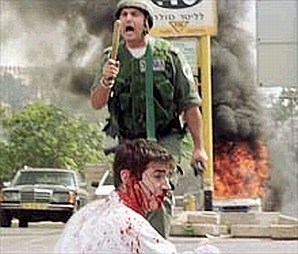 Last March and April, for example – in a period when it ran almost no stories on the hundreds of Israeli victims and survivors of suicide bombs (which were then occurring at a record rate) – the Times carried at least four stories quoting Adam Shapiro, an American Jew who entered Ramallah to protect and assist Yasser Arafat when Israel responded. But perhaps, when future historians examine the Times’s record in this period, they will conclude that their biggest mistake of all was to have spent years sanitizing the image of Yasser Arafat, in effect helping to persuade Western governments to continue propping up his regime even as both Palestinians and Israelis died and the formation of a democratic Palestinian state was continually delayed. The Times has consistently underplayed Arafat’s role in orchestrating the ongoing terror against Israel. It has failed to report how the al-Aqsa Brigades, the militia Arafat set up after launching the Intifada, has been responsible for as many Israeli civilian deaths as Hamas. 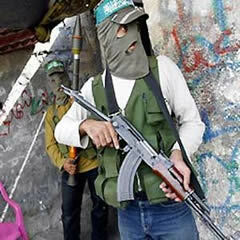 Even when the al-Aqsa Brigades proudly claims responsibility for killing a mother, her 5- and 4-year-old sons, and two other Israelis at a Kibbutz (as it did on November 10 of last year, posting a photo of the perpetrator on it website), a front-page Times report on December 17, 2002 which referred to the killings, described the gunman merely as “mysterious” – as though it wasn’t known who had pulled the trigger. 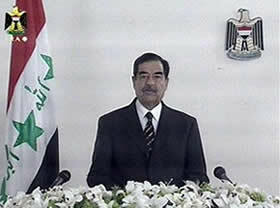 Over the last year, the New York Times has devoted hundreds of thousands of words to both Arafat and Saddam Hussein. 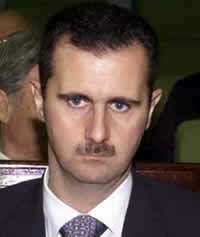 Yet you would be hard-pressed to find any reference to Arafat’s continuing support for Saddam. 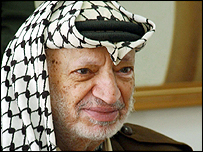 When Arafat sent “holiday greetings” to the Iraqi dictator, as he did last month in a telegram (reported in other Arab and Western media on February 22, 2003), calling him “Your Excellency, Brother-President Saddam” and writing that “Together, hand in hand [we will march] to Al-Quds Al-Sharif [Jerusalem] with the help of Allah” – you won’t find mention of it in the Times. The Times will publish an editorial which it says was written by Yasser Arafat (“The Palestinian Vision of Peace,” February 3, 2002) allowing him to make statements such as “I condemn the attacks carried out by terrorist groups against Israeli civilians.” But it will barely report that in that same week, at a rally in Ramallah (February 7, 2002), Arafat repeated his call for “millions of martyrs” to attack Jerusalem; nor will it emphasize that it was the Arafat-affiliated al-Aqsa Brigades that claimed credit for an attack on Israeli civilians in Moshav Hamra, a farming community, on February 6, 2002. The Times even took the unusual step, in its February 3 daily e-mail update sent to subscribers (“Today’s Headlines from NYTimes.com”), of listing Arafat’s op-ed as the lead article in the International news section, even though it has a specific Op-Ed section in the daily digest. The Times’s e-mail update did not identify the story as an opinion, nor did it identify the author. It just read: “Palestinians want to live as equals alongside Israel in an independent and viable state on the territories occupied by Israel in 1967” – a very different message than that being broadcast at the same time in the Arafat-controlled Palestinian media. Even though Arafat’s standing internationally is now greatly diminished (though no thanks to New York Times reporting), the Times continues its pattern of omitting information that might cast him in a bad light. Two weeks ago, for example, on February 27, Forbes magazine released its annual list of the world’s wealthiest people. In a new category for “kings, queens, and despots,” it ranked Arafat sixth, just behind Britain’s Queen Elizabeth. Yet, while the Times did run a story on the corruption of the Palestinian Authority – “Palestinian Assets ‘a Mess’ Official Says,” March 1, 2003 – correspondent James Bennet not only refrained from mentioning the Forbes findings, he barely even mentioned Arafat’s name. The man who has maintained an iron grip on Palestinian finances and funds for the past four decades apparently has nothing to do with the corruption. WOULD THEY DO THE SAME TO MECCA? The Times works against Israel in other, subtle ways, too. Sometimes it is the small words that creep into news pieces in an attempt to tarnish Israel: “After 26 months of Palestinian suicide bombings and pitiless Israeli retaliation,” reports Michael Wines – December 8, 2002. 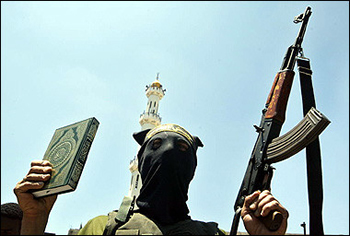 (Apparently it is not the suicide bombers that are “pitiless.”) Or sometimes in the course of the same article, armed Arab rioters trying to kill Jews are referred to as “demonstrators”; meanwhile, Jewish rioters “rampage” when they respond (as in a report by Deborah Sontag, October 10, 2000, or in a report in the Times on the same day by Chris Hedges, titled “Crowds of Jews Rampage in Nazareth”). On other occasions, information that might cast the Palestinians in a bad light is omitted. For example, even though its news reports are much longer than those in most papers, no mention was made in the Times of the mass celebrations in Gaza following last summer’s Hebrew University bombing (five American students and teachers died in that attack). The New York Times has also subtly altered its definitions and terminology. Take the Temple Mount, for instance, which historians, archeologists, Christians, Muslims, and others have for centuries acknowledged as Judaism’s holiest place, the site of two holy Jewish temples. In apparent deference to Yasser Arafat – who has recently begun claiming that no Jewish temple ever existed there – the Times began, two years ago, to add the phrase “which the Arabs call the Haram al Sharif” in mentions of the Temple Mount. 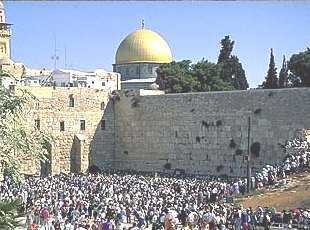 Then, a few weeks later, the Times referred to “the Temple Mount, which Israel claims to have been the site of the First and Second Temple.” And then, in a subsequent article, the Times described Israeli troops as having “stormed the Haram, holiest Muslim site in Jerusalem” – without even mentioning the status of the “Temple Mount” as Judaism’s holiest site. Would they do that to Mecca? Syria shelled Israeli positions in the Golan for three hours, hitting “El Quneitra, Nahal Gesher and Ein Zivan,” reported the New York Times (“Fighting Flares in Golan Heights as Syrian Tanks Attack Israelis,” June 25, 1970). Damascus radio announces that Syrian artillery had shelled “Kafr Naffakh and El Quneitra,” reported the New York Times (“Syria Shells Israeli Bases in Occupied Golan Heights,” November 26, 1972). A Moroccan brigade aligned with Syria is “taking part in an attack on El Quneitra,” reported the New York Times (October 11, 1973). Quneitra is now “a bombed-out military town,” following the Syrian and Moroccan bombardment, reported the New York Times (October 21, 1973). So what has happened to the integrity and professionalism of Times reporting to make its correspondents, in 2001, accept Syrian propaganda as fact? Of course, the Times is hardly alone in swallowing the propaganda of Arab dictators. During the Pope’s visit, CNN’s Brent Sadler referred to Israel’s “systematic destruction of Quneitra”; Time magazine’s Tony Karon wrote that Quneitra “was destroyed by Israeli forces in 1974 and has been maintained as a ghost town ever since”; and so on. But shouldn’t we expect more of the “paper of record”? Sontag has continued her sympathetic account of Palestinian extremists in her new job as feature writer for The New York Times Magazine, for example in a 7,700-word article (February 3, 2002) in which she allowed Palestinian interviewees to make outrageous accusations against Israel without rebuttal. 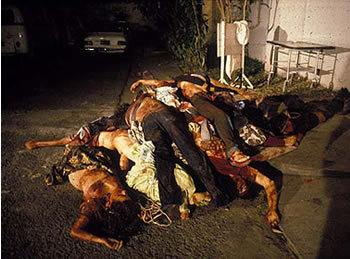 Above, death squad victims in El Salvador in 1981. We have only Hedges’s word for this claim, which was furiously rejected by the Israeli army (although Hedges doesn’t mention this in his piece). No other journalist in Gaza – and there are plenty of them – claims to have seen what Hedges does. 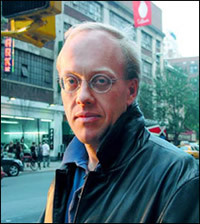 Nevertheless, Harper’s was so impressed by the quote that they flagged it in very large type on the flap attached to the cover of the magazine, and National Public Radio was so excited that they invited Hedges to repeat his allegations on the air (“Fresh Air,” October 30, 2001). Of course, the Times can’t be held accountable for an article that appeared elsewhere, but one nevertheless has to wonder how balanced the reporters it assigns to the Middle East are. Today the New York Times is held in as high regard as ever. (Last year it won a record seven Pulitzer Prizes.) But it isn’t doing a very good job when it comes to the Middle East. The distortions of the media are depressing not only because they are untrue, but because they set back the day when there might be peace and coexistence between Israeli and Palestinian. Liberals like myself want to see two democratic states coexisting in peace. But we have also followed the conflict closely enough to know that the Western media’s misreporting has contributed to the failed policies of both American and European diplomats. For ten years now, ever since Arafat returned to Gaza, moderate Palestinians – outside the earshot of the dozen different security forces Arafat has set up to safeguard his rule – have long whispered to those Western reporters who would listen that they should help to expose the corrupt, dictatorial, and duplicitous ways of Arafat and his clique. Few reporters have done so. Fine words – and it’s about time the New York Times lived up to them.